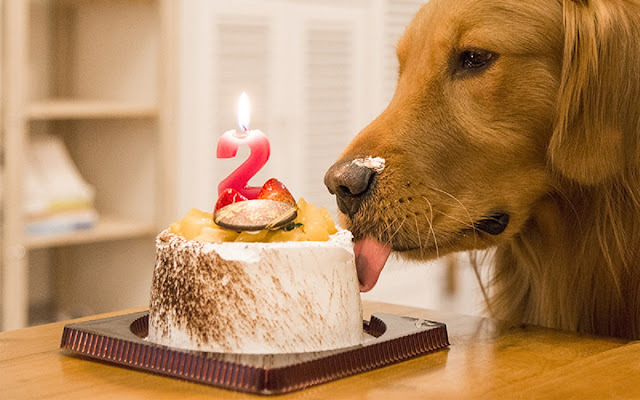 Recently, dog birthday parties are becoming very popular, many people treat their dogs as part of the family, and for people without children; dogs often become the focus of attention. When your dog's birthday rolls around you may be asking yourself the question; what kind of birthday cake should I get for my dog? There are many options as far as kinds of cakes and places to get them online and abroad. One choice for dog owners is to make their own peanut butter carrot cake. This recipe is easy and quick. The ingredients it calls for are flour, baking soda, peanut butter, vegetable oil, carrots, vanilla, honey, and eggs. Pretty much all you have to do is mix all the ingredients up, put them into a cake pan, and bake at 350 degrees for 30 minutes. You'll have a healthy birthday cake for your dog to eat in little to no time at all. If you're not the individual who wants to make their own cake then you can search the Internet for companies that make birthday cakes for dogs. After a little research, you will be able to decide which company you would like to choose. Most, if not all, of these companies, will ship the cakes to you in a very short period of time. They offer a wide variety of ingredients, and styles of cakes to meet your needs. In addition, they do sell other items that may be of interest such as treats, toys, and other dog related items. You may want to check out your local grocery store and see if they have any cakes that would be available for dog consumption. Of course, you want to stay away from anything that has chocolate in it. Doing a bit of research on the Internet will enable you to select a good choice in regard to a birthday cake for your dog. You will want to ask your veterinarian what would be okay to give your dog (if shopping at the grocery store) especially if your dog is on a strict or selective diet. If you don't get your dog a birthday cake then you may just want to stock up on some extra dog treats and or biscuits. A trip to your local pet store should satisfy your requirements. Ask the salesperson if they have anything special for a dog's birthday. They may have items there that are specific for this event, and they may even have some items that you wouldn't have thought of. There are many other resources to look at in regard to dog birthday cakes and items to buy. Besides taking a trip to your local bookstore, you may want to conduct a search for dog birthday cake ideas online. Research the items that are of interest to you, and try out new and creative things. Your dog will be happy no matter what you choose, and it will be fun to experiment.